The environment’s lengthy dwell time (typically around 40 minutes) is perfect for executing a marketer’s ideal scenario of “optimum message repetition”. 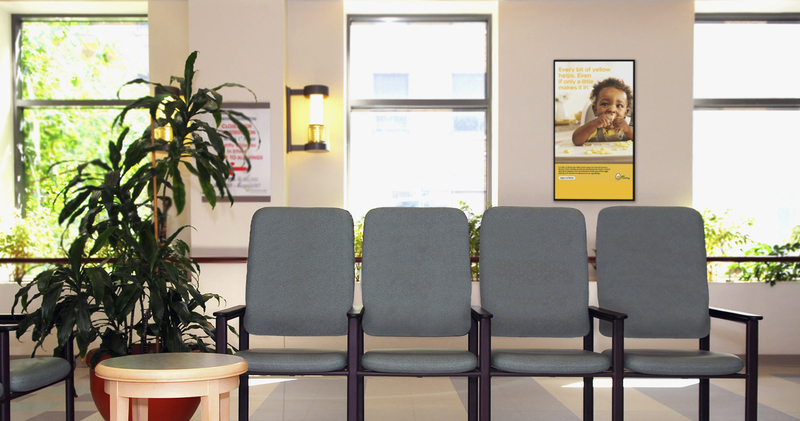 The ads displayed in the waiting room area work to engage, inform and educate consumers on a wide variety of topics: nutrition, women’s health, lifestyle products, family health issues, financial services and more. Why choose the Health environment? Not only does it offer an opportunity to reach consumers at their doctor’s office, a trusted and highly influential environment, but where else can you get up to 40 minutes of Canadian consumers’ time? Moreover, they are not only focused on their lives and well-being but also those of their families and friends. While some patients may be present for annual check-ups and others looking for remedy for recently developed symptoms, all individuals in the waiting room provide an audience of Canadian consumers, ready and willing to act. Research has shown that over 56% of our audience reacts to a call to action from information seen in the waiting room. Customers have no choice but to patiently sit down and wait for their appointment; not only is it a great opportunity to offer information but the captive environment is perfect for engagement and brand recall. The vast majority of screens in this network run ads full-screen with no intrusions on your valuable paid space, ensuring your information is received and absorbed. The remainder of content in the loop is contextual and relevant and often focuses on personal health and welfare. Every supplier has slightly different screen specifications and format support, but not to worry. Just upload a HD version of your creative in the right orientation and we’ll automatically generate creatives converted to the right format and resized to fit every supplier’s specs. Please note that in this environment, the ad creative may share the screen with content such as weather information and a news ticker.